Miracles of the modern world. And our acquaintance will begin from the natural attractions of China. The Giant Buddha of Leshan. Unfortunately, there are just a few rivers in China that are not polluted. This is a kind of payment for economic development. But still, there are some places not touched by industrialization. 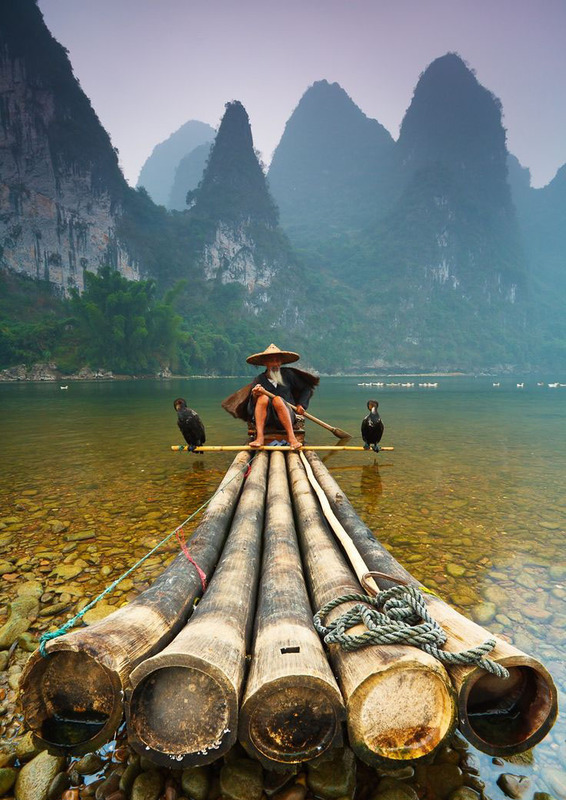 The most picturesque and beautiful river is Li River. This river weaves between forest hills, small fishing villages, and rice fields. The route of a river cruise from Guilin to Yangshuo is the most bright and popular. In contrast to Chinese rivers, mountains are as beautiful as they were thousands of years ago. This place is one the most beautiful places in the world. Huangshan Mountains are literally translated as “Yellow Mountains”. On the tops of granite peaks, high trees are growing hidden by clouds; and when sun rays come through them, wonderful light and color effects are formed. Besides that, one more attraction, only manmade one, Bridge of Immortals, is situated on the top of the mountains. In order to get to it, one may walk along the ancient path with 60 thousands of carved steps or use blessings of civilization and move up by means of the ropeway. Potala Palace which at the same time is the largest pagoda in the world is situated in Lhasa City, Tibet, at the height of 3.7 thousand meters. This is the palace considered to be the residence of Dalai Lama, but the last Lama is at variance with PRC’s government, that is why he lives in India. The total area of the palace is 360 thousand meters; its height is 170 meters. It is the largest monumental construction of Tibet. It is worth visiting, even if you are not interested in Buddhism. The view of the Himalayas surrounding the palace will touch your feelings. Forbidden City or Forbidden Palace is one of the most famous and large palaces in the world. The total area of the palace is over 72 hectares. During almost five centuries China’s emperors governed the country from this very place. Forbidden Palace was a home for 24 emperors. Nowadays, it is one of the most visited museums in China. In fact, it is a complex consisting of various constructions greatly reflecting Chinese culture and architecture. It is situated in the very center of Beijing opposite to Mao Mausoleum. It is worth mentioning that the best time for visiting it is morning, as there are really long lines of tourists other times. 150 horses of horse cavalry. And all these statues are made in full length, and their detail is really impressive. Each sculpture has each detail picked in, and all 8 thousands of soldiers are different. The Terracotta Army was found in 1974, and in 1987 it was included in the list of UNESCO world heritage list. This attraction is situated in Xian – the ancient capital of China. In fact, the name Mogao Caves is literally translated as “caves, not for tall people”; the Mogao Caves are a sanctuary complex consisting of 492 sanctuaries. It is considered to be one of the earliest Buddhistic holy places in China. This complex is situated 25 kilometers from Dunhuang City. In the first place, The Mogao Caves are famous for their frescos. The total area of all frescos is 42 thousand square meters. One more peculiarity of this place is a period of its construction. In total, this complex was being built during almost thousand years – from IV till XIV century. From its name, one can understand that it is a really big attraction. And this statue of Buddha, situated near Leshan City, is really considered to be one of the largest in the world. Its height is 71 meters. And it is no coincidence. In accordance with Chinese metric system, 71 meter equals 360 fathoms which mean 360 days of the Chinese calendar and 360 points on the human body. The uniqueness of this statue of Buddha is that it is carved in a cliff. Earlier, its body was hidden behind pagoda; but after it burned the statue is fully seen. Great Wall of China is the eighth Wonder of the World. This is usually the number one attraction in your travel China guide. Of course, if it was up to me to create a rating, it would take the first place as well. Everybody knows this place, even those who don’t know where China is situated. Wall’s length is 8851 kilometers; it is built in the northern part of China. Construction of the Wall started in III century B.C. During the rule of different dynasties in the Celestial Empire, the Wall was destroyed and reconstructed. In 1987, it was included in the UNESCO world heritage list; and now it is the most visited attraction in China. By the way, the popular myth that the Great Wall of China is seen from space is rather controversial. For now, it is only confirmed that it can be seen on satellite images. There are so many people have visited this place. You may even meet a beautiful and famous Chinese actress or actor walking and enjoying this popular Chinese landmark. What Could the UK Learn from European Eating Habits?